Includes four 8" x 8" two-sided square boards, featuring pegged circle and square grids on either side. 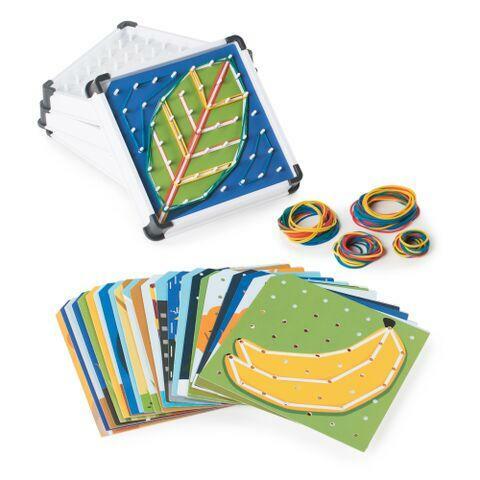 20 pattern cards are provided to enhance each child’s learning experience, which along with the multi-colored rubber bands, help develop color and pattern recognition. Each board has over-molded corner feet for enhanced durability and stability. 4 sets of multicolored rubber bands are included to overlay around the pegs on the board to create the geometric images shown on the activity cards.